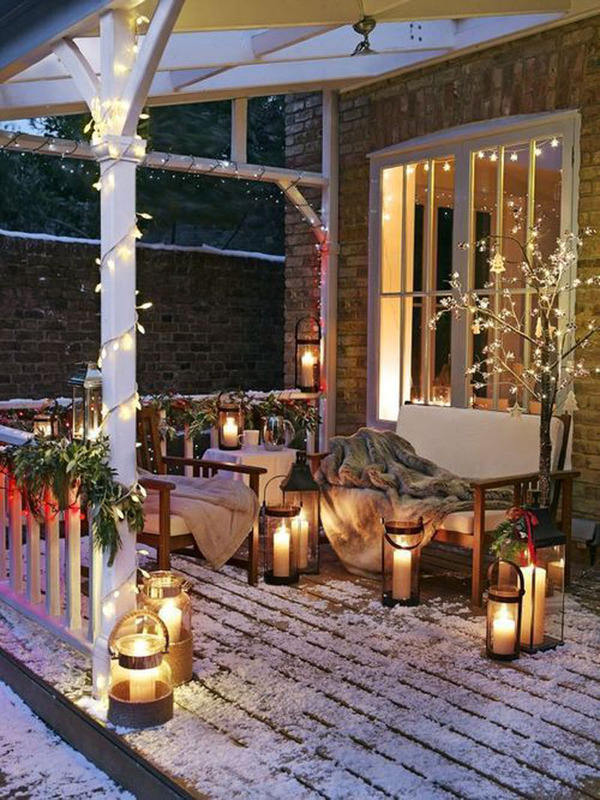 Outdoor Christmas Decorations: 19 Best Ideas for Your House! Decorating the house for Christmas is as fun as opening presents on Christmas morning. A great way to celebrate the Christmas festival is to bring alive the joyful spirit of Christmas in and around your home. 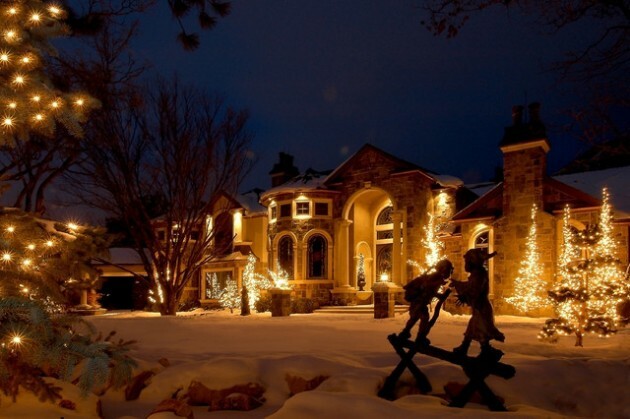 Therefore Light up your home & yard with all different kinds of outdoor Christmas decorations! Christmas tree, Christmas wreath, Christmas garlands, Christmas ornaments, Christmas lights, Christmas stockings, and other holiday accents can transform any space into a festive wonderland. To bring alive the Christmas spirit in your house little efforts may have to made to decorate the every area of your house which includes the outer part too! Must Read: 15 Tips to Decorate Your Home Indoor in Christmas! Outdoor christmas decorations start with the entry. You can convey a cosy welcome with a garden inspiring the decorating theme. For e.g. Rustic aluminium containers on the door, porch, & stairs which offer a casual Christmas festival appeal when filled with herbs and bright accents, such as red blooms and berries. For a red-carpet look, you can create a runner with checkered fabric and green burlap that spans from the door to steps. You can have a royal welcome by hanging lanterns topped with a faux cardinal. This seasonal lighting solution helps to introduce your outdoor Christmas decorations – theme right at the front door! 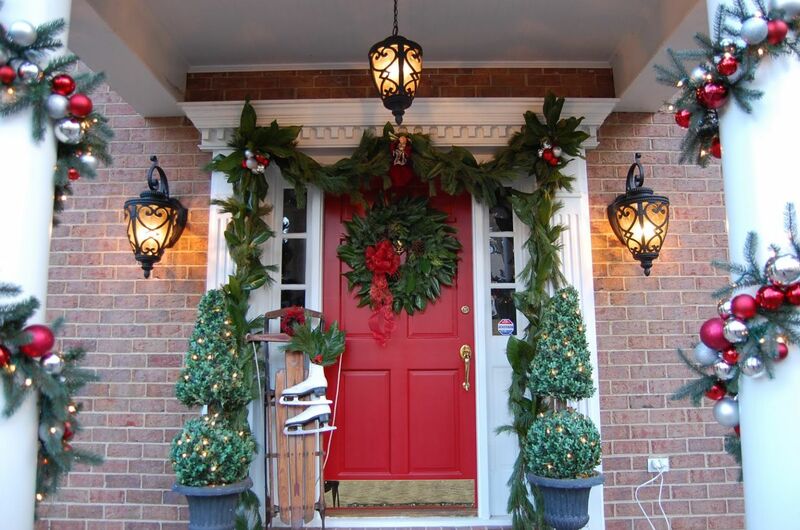 The external entryways offer an excellent opportunity to get personal with holiday decor. The simple way to light up the season is a brilliant collection of paper luminaries along with the candelabras made from discarded wine bottles, a garland made from rope and lanterns and evergreens placed in galvanised metal buckets. etc. You can line them along front walks, porches & driveways for a fiery outdoor Christmas decorations display. Once the sun goes down, the entryway instantly becomes more intimate as the glow created by the candlelit wine bottle candelabras and interior & exterior lights of the house. Pull the elements from your home’s decor right into the centre of action by dressing up your outdoor furniture. You have throws available to let Christmas guests know you have their comfort in your mind! 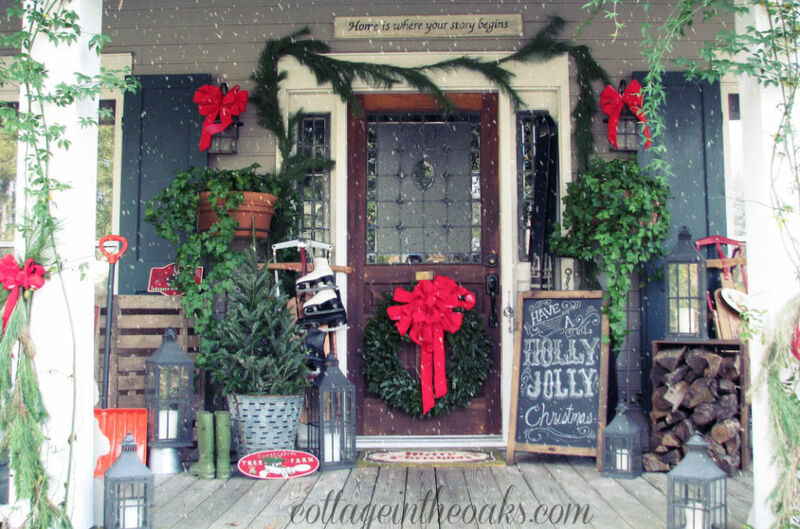 Outlining a front door in garland is an elegant & simple way of welcoming the Christmas festival or season. You have to plant evergreen bushes in a galvanised tub or wood basket and also miniature outdoor trees which will add a greenery to the bare porch. You can also try to hang a basket filled with greens, pine-cones or holly. Although the grass tends to dry up during the winter months, you can still add a pop of green to your holiday kerb appeal with potted evergreens, particularly the juniper and cypress bushes. Dress them up with organic style by decorating them with burlap ribbon. Simple way for outdoor christmas decorations is to decorate your outdoor trees other than a Christmas tree to lit it up with lights which will give you the elegant appearance at night! If you have a fully decorated Christmas tree on an entrance porch for a classic display you can appreciate it from inside & outside both! For those of you that do not have a porch but have stairs that lead to your home or landing, you can decorate the entrance by placing a message up the steps for your guests and family to enjoy. These steps are decorated with a red or green potted plants placed on each step with christmas ornaments and decorative features in red & white to bring out the blossoming of the plant foliage. 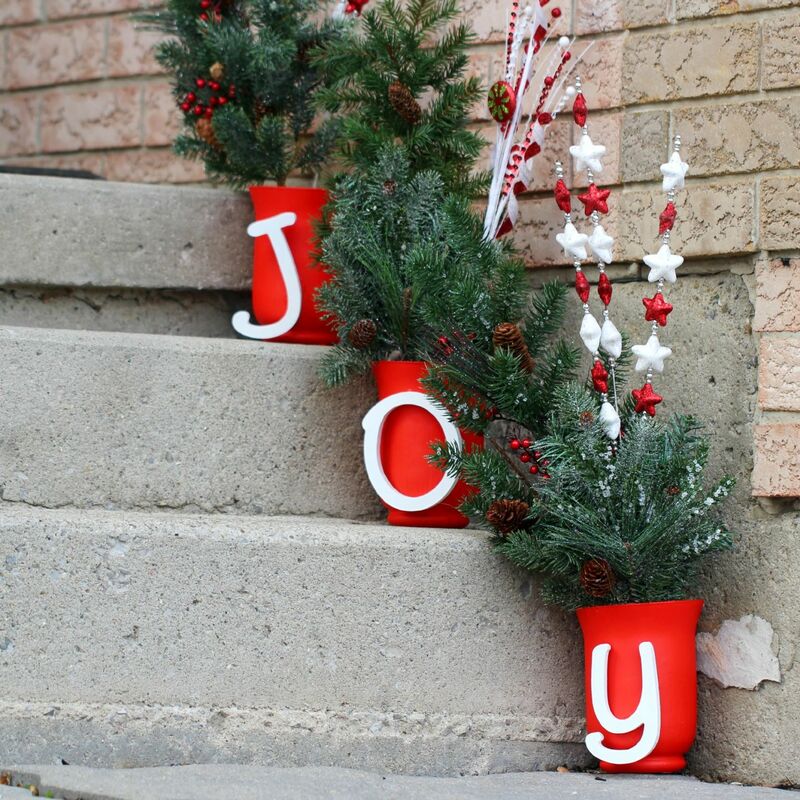 The message of JOY is displayed by placing one letter on each of the potted plants in white. The touch of cranberries and pinecones offer a joyful touch. Christmas wreath decorates the door and porch columns. The Christmas wreath has a big red bow while the doorframe outdoor christmas decorations contains two red and silver globe christmas ornaments on each side. The columns go a little wild with red and silver christmas ornaments running the length of the wrapped column. You can find Christmas wreath in any style like traditional of flowers & evergreen plants, modern and contemporary twists with different materials & shapes. Here is another idea of using pine cones which are typically measure a foot long, look festive from near and far. Welcoming your guests with a dramatic swag of flocked sugar pinecones & lichen-covered twigs accented with incense cedar and other holiday greens, some right from the yard. For an extra layer of visual interest, consider hanging mistletoe or pinecones along the centre of the top of the arbour! An original idea is to decorate your hanging flower baskets by adding christmas lights to the bottom of the basket and filling the inside with a holiday symbol, like silver metal stars. This idea can be used in many hanging flower baskets at your porch, deck, balcony, etc. You can hang twinkling Christmas lights on a fountain or stone wall in the garden to create a striking winter focal point from your patio or porch. Even if it’s too cold to entertain the outside, you can enjoy the soft cosy glow through the windows too! You can use jars filled up with christmas lights and can also add a touch of green by installing forest green lamps in the exterior of your home or shed for outdoor christmas decorations. 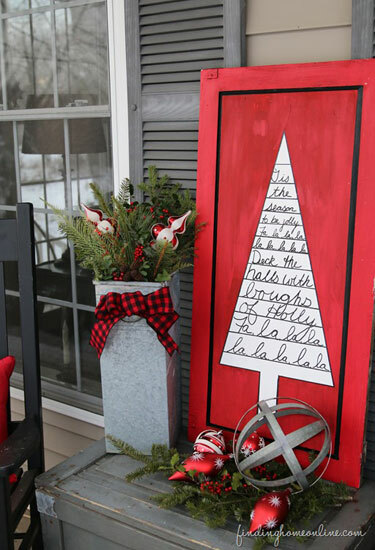 You can arrange a group of festive lanterns at your entryway for a quick & easy holiday style. You can also use the flameless candles as a worry free factor! It is a welcoming sign reading “Joy“, with the heaps of snow covering each part of it can make it more festive during Christmas! You can simply show-off your favourite lyrics of Christmas song by displaying them on a board! The signs should be used with red and green colours with white lettering to list the key holiday destinations. 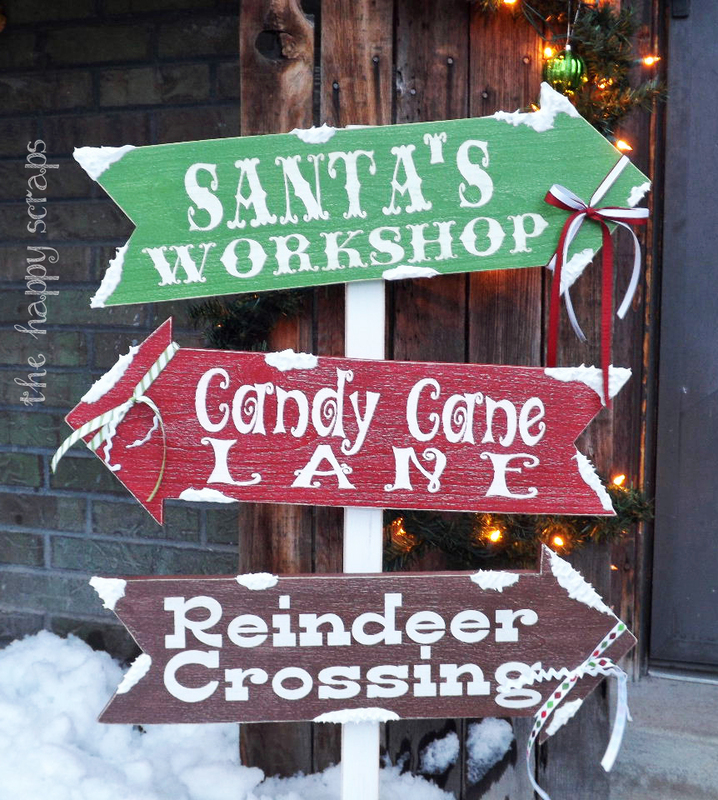 You can also add ribbons & strings to the signs to bring attention and making fun to read it by your children & neighbours. To turn this basic mailbox into a focal point, you can surround it with giant candy canes made from plywood & burlap as well as lollipops made from PVC, small bouncy balls, etc. You can also add life to your mailbox by draping it with garland. An average mailbox gets a seasonal makeover with some evergreen branches, pine cones and a burlap bow. 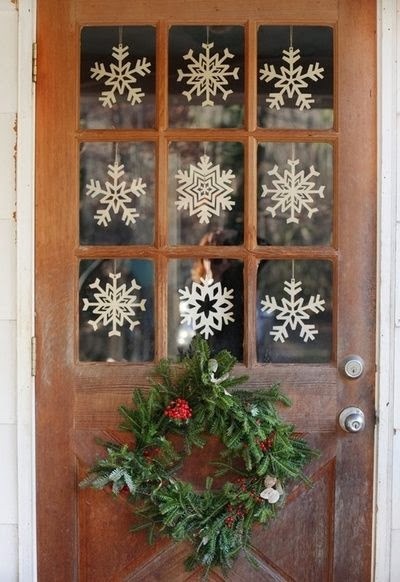 You can use the snowflake decals or hang cut-outs to fill each glass panel of your front door. Using an old wine bottles bring a soft glow to any outdoor area with candelabra made updated with matte black spray paint. To ensure visibility from the sidewalk or street, use white pillar candles. 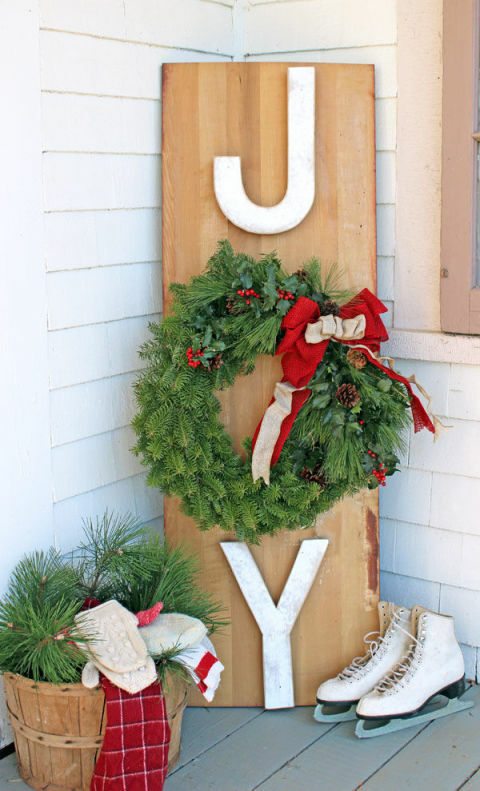 To create a festive welcome sign for Thanksgiving, Christmas & New Year’s use chalkboard buck-head silhouette. To make this, simply trace a reindeer shape on a piece of plywood, cut it out with a saw and apply two coats of chalkboard paint. Write messages to coordinate with each holiday. You can create a unified and sophisticated alternative to mismatched Christmas ornaments with glittering balls & stars in various finishes. You can also cluster the small Christmas ornaments together for a big impact. These tiny jingle bells recall the larger ones on top of the tree and are so charming when they are used in abundance! You simply need to thread them together with string & hang. No need to remake your decorations each Christmas; you can stick with the familiar. It’s ok if you use the same christmas ornaments every year! Decorate with vintage glass christmas ornaments and ornaments given to you by friends and family. 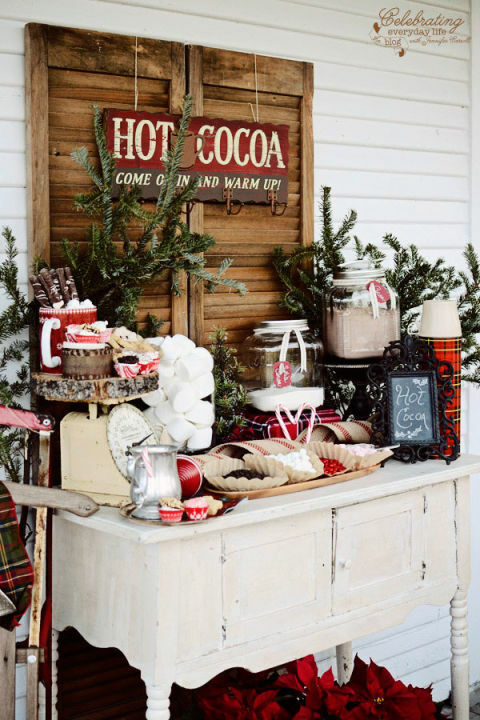 By having a hot cocoa bar on your porch, the guests will feel warm and cozy before stepping through the front door! Next PostNext Necessity of Pile Foundation!